Regency at Monroe, set in Middlesex County, New Jersey, is a luxurious active adult community that features elegant homes, a wide array of amenities, and a variety of social clubs. This gated age-restricted community welcomes residents aged 55 and better, and provides many features that support an active lifestyle. Just a few of the community's highlights include a 40,000 square-foot award-winning clubhouse, a beautiful 9-hole golf course designed by Arnold Palmer, and a state-of-the-art fitness center complete with spa facilities. With its prime location in Central New Jersey, Regency at Monroe is situated about 90 minutes from popular destinations such as New York City, Philadelphia, and Atlantic City. There is plenty to do closer to home as well. The surrounding area includes many shopping, dining, and cultural attractions, while the nearby Jersey Shore is the perfect spot for a beautiful day at the beach. Regency at Monroe's spectacular 40,000 square-foot clubhouse has won many awards, including the 2008 Best Clubhouse SAM Award presented by the New Jersey Builders Association. This impressive clubhouse features many popular amenities, such as state-of-the-art fitness facilities, which includes cardiovascular and strength-training equipment, as well as fitness classes. The fitness center also contains a spa, steam rooms, and an indoor swimming pool. Indoors, this clubhouse also offers a cozy fireside clubroom, a coffee lounge, a library, a business center with computers, card rooms, billiard rooms and an arts and craft studio. The 1,000-person capacity multi-purpose room includes a state-of-the-art multimedia theater with surround sound, a performance stage, a dance floor, an event bar, and dining space, complete with catering facilities. With a variety of specialized rooms and a large multipurpose space, this community is well equipped for nearly any community event. In addition to the amenities found in the Regency Clubhouse, residents can also stay active with an outdoor swimming pool, tennis courts, shuffleboard, and bocce ball courts. Golf enthusiasts will appreciate a challenge to their short game at the community's beautiful 9-hole course, which was designed by Arnold Palmer's Palmer Course Design Company. And those with a green thumb will be happy to toil away in Regency at Monroe's lovely community garden. Regency at Monroe also has scenic walking trails that include strolls around beautiful ponds and a gazebo. There is also a playground for grandkids for when the family visits. Regency at Monroe plans to encompass 1,200 single-family homes and homeowners can choose from a selection of 16 different floor plans, which range in size from 1,884 to 3,120 square feet. These one to five bedroom and two to three-and-a-half bathroom single-family homes each include a two-car garage and optional basement. These impeccably designed homes include many features that discerning homeowners will appreciate. Gourmet kitchens offer easy entertaining innovations, first-floor master bedroom suites include luxurious bathrooms, and formal living and dining rooms are sure to impress. These lovely designs also include cozy family rooms and plenty of large windows that open to lush golf course views. The homeowners' association also takes care of lawn and landscape maintenance, snow removal and trash collection. With its spacious, award-winning clubhouse, Arnold Palmer designed 9-hole golf course, and beautiful homes, Regency at Monroe provides active adults with luxurious resort-style living. Between the on-site amenities and the shopping, dining and cultural attractions found in the surrounding areas, there are plenty of activities to pique the interest of any active adult. A full-time activities director is also on hand to help residents make the most of life at Regency at Monroe by helping them find an appealing social club or plan an off-site excursion. The social clubs here span many interests. There are special interest groups for hobbies such as photography, fishing or bowling. There are men's, women's, and single's clubs, as well as a local Red Hat Society. The spacious clubhouse and beautiful grounds also offer plenty of areas for impromptu gatherings or quiet relaxation. From saxophone group to Scrabble, residents set their own level of community involvement. Set in picturesque Middlesex County, Regency at Monroe enjoys a prime Central New Jersey location that offers residents many nearby popular destinations. The community arranges frequent excursions to New York City and Philadelphia, which are each within 90 minutes of Monroe. Atlantic City is another popular day trip for residents who want to take in a Las Vegas-style show or enjoy a night in the casinos. Closer to home, residents can spend an afternoon at either the Monmouth or Freehold Racetracks. They can also enjoy musical performances or theater productions at the PNC Bank Arts Center, The George Street Playhouse in New Brunswick, or the McCarter Theatre at Princeton University. The nearby Jersey Shore makes for a beautiful day at the beach and offshore fishing excursions will delight resident anglers. 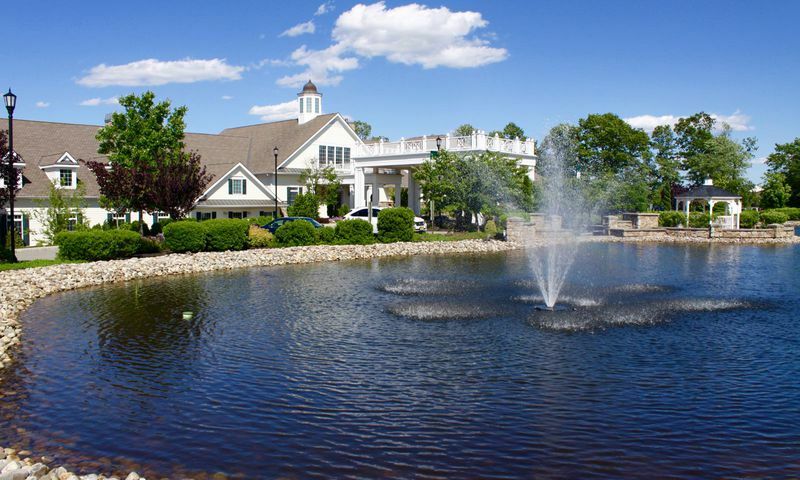 Regency at Monroe it the ideal active adult community in Middlesex County, New Jersey. Regency Clubhouse - 40,000 Sq. Ft. There are plenty of activities available in Regency at Monroe. Here is a sample of some of the clubs, activities and classes offered here. Regency at Monroe offers 16 models that range in size from 1,884 to 3,120 square feet of living space. These luxurious homes feature two to five bedrooms, two to three-and-a-half bathrooms and a two-car garage. Gourmet kitchens offer easy entertaining innovations, first-floor master suites include elegant bathrooms, and formal living and dining rooms are sure to impress. We purchased a resale home here last summer. At the time there were quite a few nice resale options to choose from and we got a great deal. I think the price are already starting to go up since then. The community has all the perks we wanted like the fitness center, pools and golf plus it is gated which reduces traffic and makes it more private. The homes here are very nice. 55places.com is not affiliated with the developer(s) or homeowners association of Regency at Monroe. The information you submit is distributed to a 55places.com Partner Agent, who is a licensed real estate agent. The information regarding Regency at Monroe has not been verified or approved by the developer or homeowners association. Please verify all information prior to purchasing. 55places.com is not responsible for any errors regarding the information displayed on this website.